Psalm 23 The Lord is my shepherd; I shall not want. 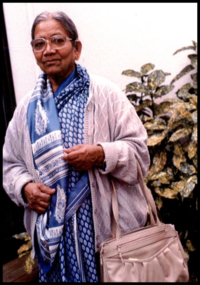 Beulah Sundaravathy Souri, 103, died April 3, 2015, Good Friday, in Olympia, Wash. She was born July 25, 1911, in Kadiri, Andhra Pradesh, India, to The Rev. John J.Souri and Shantha Souri. She studied in the Church of England's boarding school called Sherman Girls High School in Chittoor, Andhra Pradesh. She received a bachelor’s degree from Madras University and a degree in English literature from Banaras University in India. She received her teacher's training in St. Christopher's Training College in Madras. She was a professor of English literature in Kurnool, Andhra Pradesh. She taught English Literature at college in India. She served as Secretary to the Bible Society and was involved in fund raising for Bibles. Following her retirement she and her husband went to be with their children who were pursuing higher education in United Kingdom. She lived in South Wales and was a scribe who helped people in the Welsh community. She moved to London, England, in 1981. She was a dual citizen of the United Kingdom and the United States. She was a keen gardener. She loved to read. She liked history. She played violin and piano.‎ She played tennis, and was a fan of John McEnroe, Jimmy Connors, Chris Everett and Martina Navratilova. She was a keen cook and has written a Book on Indian Cookery with prologue and epilogue with biblical themes. She loved to recite poems, sing hymns both in English and Telugu and children's rhymes. She loved to knit and crochet. She travelled widely both in UK and USA . She was devoted to her children, grandchildren and her great-grandson. She married Soundaraj Daniel Souri, a professor of Philosophy and English Literature. Survivors include a daughter, Hema Souri-Parsons, London; a son, Mahadev Souri, Olympia; daughter in law, Indira; son in law, Alan John Parsons; three grandchildren, Dominic, Emmanuel and Aruna and a great-grandson, Gunner Souri-Parsons. A son, Rajkumar Souri, Redlands, Calif., ‎preceded her in death only a few months ago.